Today's cards feature some Cosmo Cricket Mitten Weather papers, a greeting from Inkadinkado, a die cut from Papertrey Ink, a snowflake die from Cuttlebug and twine from The Twinery. These cards were made with the last of a 12x12 piece of Mitten Weather paper so the layouts are slightly different to accommodate the scraps. Since they're a little different, I thought I would share both. I embossed the sentiment with SU Gold embossing powder and sponged the edges of the die cut with Vintage Photo distress ink. Before adding the twine, I used my crop-o-dile to add eyelets to the die cut. The snowflakes are die cut from Warm & Natural with button centers. Happy Black Friday! For those of you out shopping today I wish you luck. I have another Christmas card to share today. This one uses the same stamp set from Inkadinkado as yesterday's card. For this one, I embossed the tree with clear embossing powder on October Afternoon patterned paper and then sponged Walnut stain distress ink over the entire piece to bring out the embossed image. I added some brown trim I picked up at an estate sale recently along with white seam binding and a paper rose made from some vintage sheet music. The die for the rose is from My Favorite Things. I applied B00 Copic to the flower to give it some subtle color and help match it to the patterned paper. The leaves are from the Spellbinders Foliage dies. The scalloped image and sentiment both use the Spellbinders Long Classic Scalloped Rect dies. Thanks so much for stopping. Happy Shopping to those of you participating in Black Friday! Wishing all of you celebrating Thanksgiving today a wonderful day with friends and family. Hopefully you're not stressing out about the food and are able to enjoy the day. Unfortunately I don't have a Thanksgiving card to share with you today but I do have a couple of Christmas cards to share. My daughter recently found this stamp set for $1.99 at TJMaxx and bought it for me. I had to ink it up as soon as she brought it home. I paired it with papers from the Jovial collection from Basic Grey. The 12x12 papers are double sided so by using this simple layout I was able to make 5 cards from one sheet of designer paper plus a matching scrap of My Mind's Eye paper for the circle borders around the sentiment. The snowman stamp and snowflake are from Inkadinkado and the sentiment is from Memory Box. For fun, I added some A Muse Studio glitter to some of the circles around the snowman image. Thanks so much for stopping. Happy Thanksgiving! 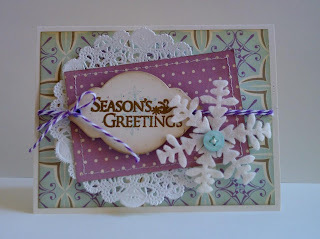 Today's card uses October Afternoon papers, a flower stamp from Hero Arts and a greeting from Clear and Simple Stamps. 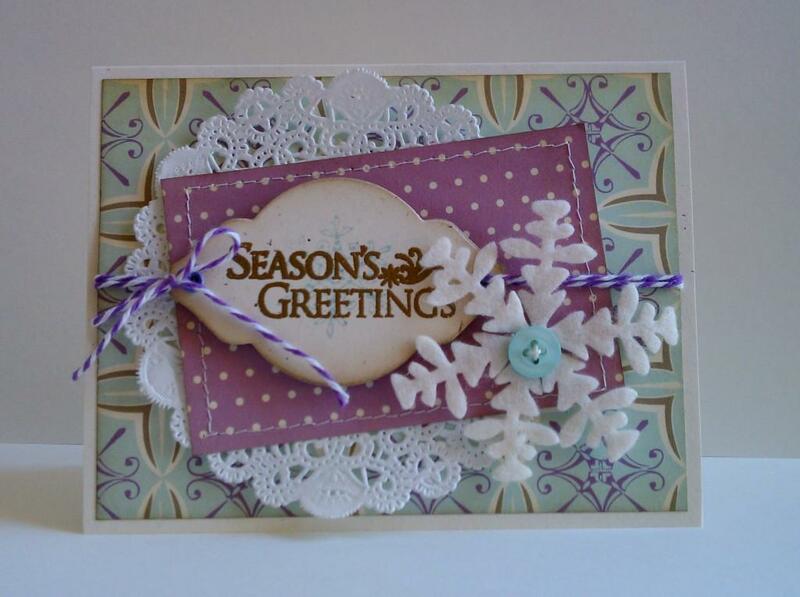 I stamped the flower with Colorbox white pigment ink and the greeting with Bubblegum pigment ink from A Muse Studio. The edges of both panels were sponged with Walnut Stain Distress ink and I also sewed around the floral panel. For some extra detail I used the large scallop die from A Muse Studio on the side strip of dp and added some lace and twine. The finishing touch is a couple of gemstones on the flowers using my i-rock tools and gems. Thanks so much for stopping. I hope you're all having a wonderful Wednesday. 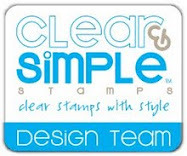 Happy Stamping. Today I have another card featuring the Pink Cat Studio Farm Animal set along with papers from the Girl Friday line by Cosmo Cricket. I used copics to color the images and added some fun lace and twine for the finishing touches. Today I have a card featuring Papertrey Ink's Fillable Frames #1 stamp set and matching die along with the large rolled rose die from My Favorite Things. I also freehand cut some leaves from a scrap of burlap. The papers are some old scraps that I've had forever. Today I have a banner to share. I thought it would be fun to make a snowflake banner so I pulled out some coffee, coffee filters, charcoal twine from The Twinery, a snowflake stamp, white acrylic paint, cuttlebug snowflake die and embossing folder, buttons and gemstones. I knew I wanted a homespun look for my banner so I brewed up some coffee and soaked the coffee filters and twine in the coffee to give them a nice aged look. Once the filters and twine were dry I folded the filters in half and glued the twine around the edges. 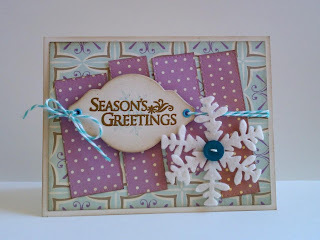 Next I stampted some snowflakes with white acrylic paint and die cut and embossed some snowflakes. The snowflakes each got a button center and were attached to the banner with a glue dot. For the finishing touch I added some red gemstones (clear colored with a red Copic) to the center of the stamped snowflakes. I really like the aged look of the twine and coffee filters from soaking them in the coffee. It really makes the white snowflakes pop. For now the banner is hanging in my stamp studio but I think it will be moved to the piano after Thanksgiving. Thanks so much for stopping. I hope you're having a banner day! Sorry, I couldn't resist. So have you started on your Christmas cards yet? After attending the October Afternoon warehouse sale last month where I found some 8x8 packs of Good Cheer, I had to come home and get started making Christmas cards. Here's one of the cards I made with the Oct Afternoon papers and a plastic candy cane that I picked up at a tag sale this summer. I finished it off with a button and bow and a sentiment flag. The card won't mail well with the bulk of the candy candy and button so I guess it will have to be hand delivered to someone special. Today I have a card featuring Papertrey Ink's Delightful Dahlia and papers from Basic Grey's Perhaps collection. I just used a variety of Basic Grey Perhaps scraps to cover a PTI Rustic cream mat and then layered on a doily and a dahlia and leaves stamped on the solid papers in the Basic Grey collection. For the finishing touch I added some solid pink twine. Today's card features the Papertrey Ink Botanical Silhouette's set and some Basic Grey papers. After stamping the flowers, I pulled out my Copics and drew in a little detail on the flower centers just to give them a little different look. I also used a white gel pen for a shadow down the stems of the flowers. I gives it just some nice subtle detail. It's always fun to have a special card for a milestone birthday. Today I have a card celebrating a 30th birthday. I didn't make it with anyone particular in mind, I'm actually planning to list it in my Etsy store. The card base is SU Not Quite Navy with a PTI Rustic Cream mat that I stamped with the number background from the Glitz Distressing stamp set in A Muse Studio burmuda ink. The sentiment strip edges are inked with some Vintage Photo Distress ink and the sentiment is stamped in A Muse Studio Navy ink. The sentiment is from the PTI Big & Bold Wishes stamp set. The floral piece is a journaling card from October Afternoon's Detours line. The tag and numbers are from the Cuttlebug Red Tag Sale set. I also added a circle punch of October Afternoon Freshly Mown Lawn paper from the Daydreams line and a rustic cream circle die cut with Spellbinders Nestabilities Large Pinking Circles. For the finishing touch on the tag I tied some twine from The Twinery on the top (honeydew, caribbean, peapod). Today I have another card featuring the October Afternoon Rocket Age papers. This time I paired them with a robot stamp from a Sandylion Boy Clear set that I bought a while back at Michael's. I thought they worked well together. The Robot was stamped with navy ink, colored with Copics, then cut out and mounted with pop dots. The sentiment is from Papertrey Ink's Birthday Bash Sentiments set and is also stamped in navy. Today's card features papers from October Afternoon's Rocket Age collection that I recently acquired at their warehouse sale. It was my first warehouse sale and I thought it was totally worth traveling 170 miles! Ok, back to the card. I paired the October Afternoon papers with a stamped sentiment from Papertrey Ink's Birthday Bash Sentiments set. For the finishing touches I added some Navy twine and a button. Today's card features the Cushioned in Comfort stamp set from AMuse Studio and papers from the Basic Grey Perhaps line. The chair was stamped on the white piece and then again on patterned paper, cut out and mounted with pop dots for some added dimension. I also added some Pearl Cotton and a button for the finishing touch. The table and lamp were colored with copics and a white gel pen was used on the lampshade for some extra detail. Today I have another card featuring the Pink Cat Studio Farm Animal set along with papers from the Girl Friday line by Cosmo Cricket. I love the little owl in the Farm Animal set so I used three of him on this card. The sentiment is from the Papertrey Ink Birthday Bash Sentiments set. I also used copics to color the images and a papertrey ink notebook die for my owls and sentiment. 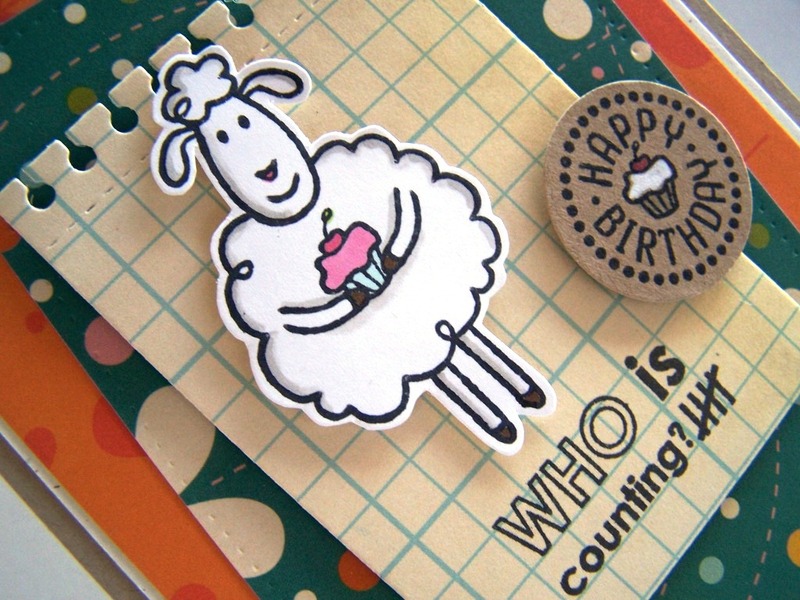 Today's card features the adorable sheep and Happy Birthday stamp from the Pink Cat Studio Farm Animal set along with a Who is Counting? sentiment from Papertrey Ink's Birthday Bash Sentiments set. The papers are from the Girl Friday line by Cosmo Cricket. 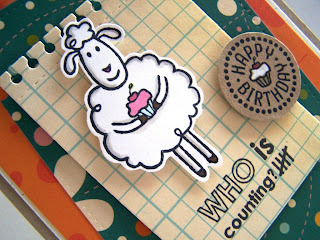 I also used copics to color the image, a white gel pen on the cupcake frosting and a papertrey ink notebook die.